We are offering Floor Type Boring And Milling Machine to our clients. - High unbending nature of structure and drives. - Separate Drive for the shaft and the table developments. - Single lever control of bolsters and fast navigate. Our clients can avail from us a wide assortment of High performance Vertical Turning and Boring Mills that are used for boring purposes at various construction sites. 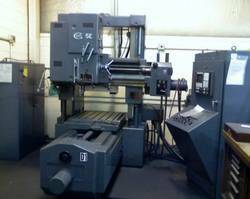 Manufactured using high grade components, these mills are in high demand across the globe. The Precitec UABMH-150 attatchment is specially designed for heavy duty horizontal moving column boring machines which can take heavy attatchment. the unit facilities various activities like milling, boring, drilling etc ate any given angle. for this unit has a provision for alignment of the head in any direction (Universal). - Max Turning diameter 62"
- 2 Ram Heads 30" of travel capable of swiveling to 45°.